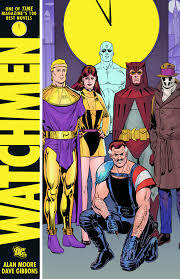 Thirty years on since Issue 1 of ‘Watchmen’ was first published, has there been a better graphic novel/comic book serial? Is it really the greatest graphic novel of all time? Now, I’m no graphic novel/comic book expert. Graphic novels, I’ve read a few…the heavy hitters spring to mind, like ‘The Dark Knight Returns,’ ‘V For Vendetta.’ Daredevil: ‘The Man Without Fear’ and Batman: ‘The Killing Joke’ also number my small collection. 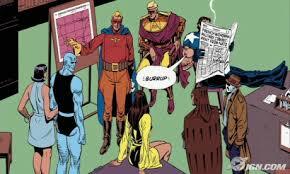 However, even without any knowledge of graphic novels, it’s easy to say that ‘Watchmen’ is a masterpiece. It’s easily the greatest graphic novel that I’ve ever read. The best thing about ‘Watchmen’ is how it works on a variety of levels. Firstly, the story draws you deeper and deeper from the very first page. Having a murder of a costumed hero happen in the first few pages is shocking, but also involving. Following Rorschach’s investigation and trying to pick out the murderer is one of the pleasures of initially reading ‘Watchmen.’ A murder mystery is hard to get right: reveal too much and you spoil the ending, reveal too little and there’s nothing for the reader/viewer to hang on. ‘Watchmen’ mixes clues with red herrings liberally in a manner that always has you thinking. Everything comes together beautifully at the big reveal towards the end, without feeling contrived. However, a story without great characters is just a story. On another level, ‘Watchmen’ works as a deconstruction of not only the comic book medium, but also of the superhero. What makes someone dress up and fight crime? For example, Laurie Juspeczyk, who fought crime under the banner Silk Spectre II, was pushed into the ‘superhero’ business by her mother, Sally Jupiter (and the first Silk Spectre). Being a costumed hero comes with a lot of baggage, and ‘Watchmen’ constantly delves into that baggage. Apart from Dr. Manhatten, there are no ridiculous origin stories (he is trapped in an intrinsic field test chamber, and that’s how he acquires his superpowers). All the Crimebusters are relatable and understandable, all examples of a psychological realism that runs throughout the comic book strips. Not only do we explore who they are, but we see them in a world where a real superhero exists. There are no supervillains in ‘Watchmen’ as far as antagonists are concerned. There’s Moloch, an aged ex-supervillain who Rorschach thinks is involved in The Comedian’s murder. But there is no archenemy as such. The former Crimebusters are in a world where they aren’t wanted and are outlawed. Dan Drieberg, aka Nite Owl II, and Laurie meet up early on in the series, and all they seem to talk about is the ‘good old times’ of fighting supervillains. What is left for them now? Dr. Manhattan is little more than a puppet for the US government, as was The Comedian. Adrian Veidt, aka Ozymandias, has built a commercial empire based on his heroic past and is a billionaire, but even he seems haunted by his past. For the characters alone, ‘Watchmen’ is worth a wealth of riches. Not only do we examine the Crimebusters/Watchmen, but we examine their precursors, the so-called ‘Minutemen’ who started the costumed hero shenanigans back in the 1940s. From a visual perspective, ‘Watchmen’ is rich with symbolism, colour and symmetry. The most obvious repeated symbol is the smiley face, which not only bookmarks the series but appears several times throughout. With the added blood splatter, it’s similarity to the Doomsday Clock also present in the series is overt. Other repeated symbols are too numerous to mention. They douse the text in greater meaning. 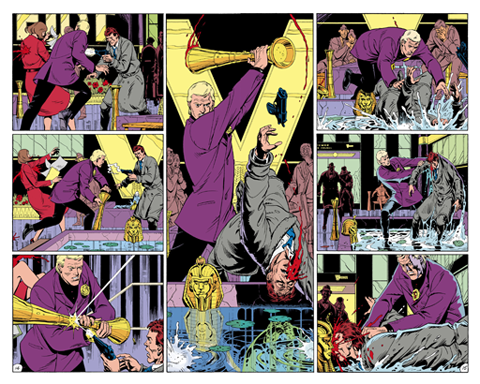 From a illustrative point of view, ‘Watchmen’ is a work of art. Chapter 5, ‘A Fearful Symmetry,’ is a tour de force of illustration, with the first page mirroring the last and so on until a panel stretches over the middle pages. The colour is vibrant, and at times, intoxicating. Just beautiful to look at! There’s hardly a negative I can write about ‘Watchmen.’ It’s been described as the comic book ‘coming of age,’ as a series where comic books grew up. That’s true, of course. ‘Watchmen’ is brimming with grit and realism. There’s violence, and barely a ‘good’ guy in sight. Everything is grey, nothing is black and white. Exploring the heroes’ pasts causes the viewer to see their heroism is a different, probably negative light. But it’s so much more than merely a realistic take on the superhero. There’s so much to absorb that even after several readings, I still found a horde of things I’d never noticed before. There’s much to enjoy about politics, philosophy and psychology. Alan Moore and Dave Gibbons together created a titan of the comic book medium, and one that might never be knocked down from its lofty pedestal. VERDICT: 10/10. ‘Watchmen’ is a masterpiece of the comic book medium. It takes everything about the medium and twists it into something new and seductive. The riches you can reap from reading it are never ending. The story, the characters, the visuals and the symbols are unparalleled in their synchronicity and brilliance. Incredibly dense! So much to take it, but worth its weight in gold. I just read this one within the last year, and I was impressed by how well it was done. I guess I wasn’t as impressed as your review indicates that you were, but I chalk that up to personal taste. I judge a story by two general criteria: the ride and the destination. This was one in which I enjoyed the ride but not the destination, but I could say that about a number of literary classics I have read and enjoyed. Good post. What didn’t you like about the destination! It was well crafted, but I prefer plausibly positive changes of fortune as a matter of personal taste. I realize that was not the purpose of this work, so I respect it for what it is. Take care. I read that Moore wanted to create an impotent Clark Kent when he created Dan Drieberg. It makes so much sense when you see it through that lens. I think the movie failed, because the great things about Watchmen, like you said the red herrings, for instance, lend themselves so well to the comic book format.